Welcome to another Tablescape Thursday with our hostess with the mostest, Susan at Between Naps on the Porch! 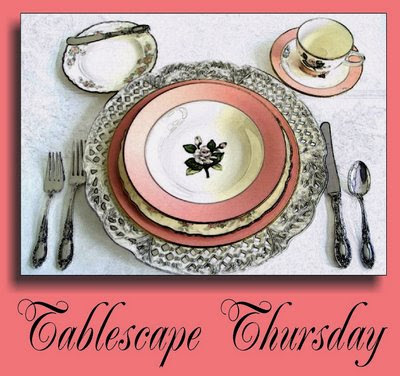 Please be sure to stop by her blog to see one of her beautiful tablescapes and to find the list of this week's participants! This week, I am asking you to use your imagination because I am inviting you to join me for le déjeuner...lunch...in an old French farmhouse in the heart of Provence. We are going to the Lubéron...Peter Mayle country! If you have read A Year in Provence, you already know what to expect! 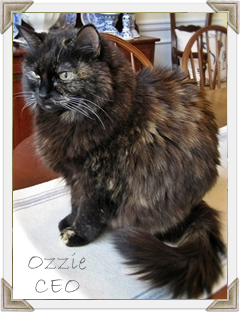 In honor of this special luncheon, our CEO Ozzie has agreed to make a rare personal appearance as our hostess! 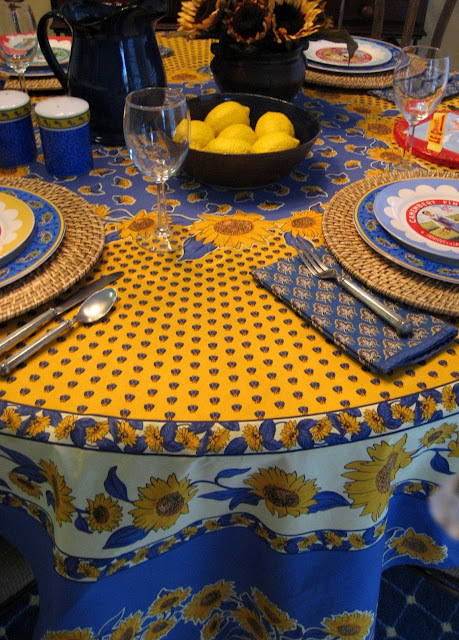 The star of the tablescape, however, is the tablecloth! 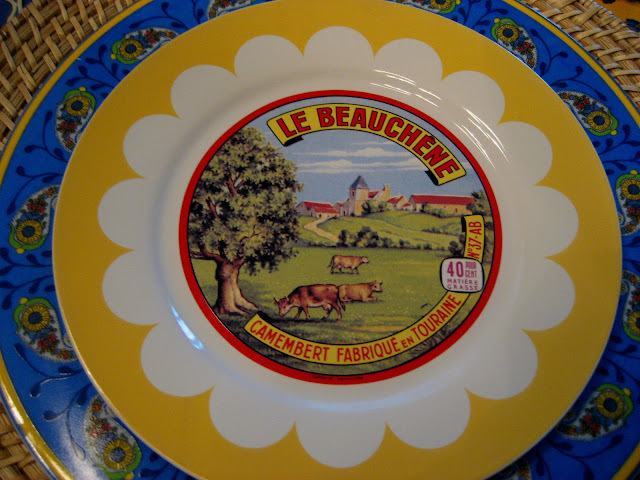 It is from Provence and is a cherished gift from a dear friend! 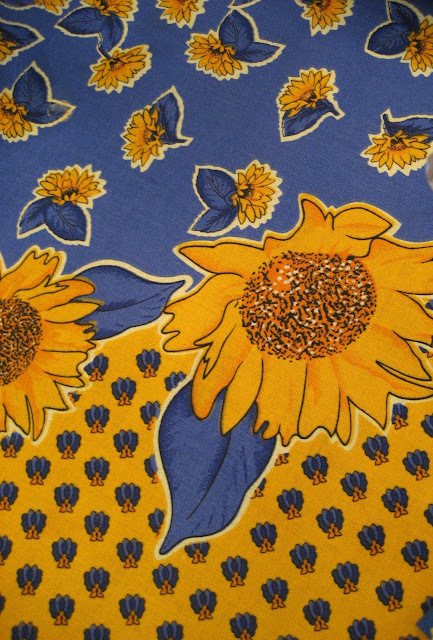 The bright blues and yellows and the sunflower design are typical of the fabrics of the region! The dinner plates are my everyday dishes from Home Goods that I have shown you before. The plates for the cheese course are actually from Williams Sonoma, purchased several years ago. 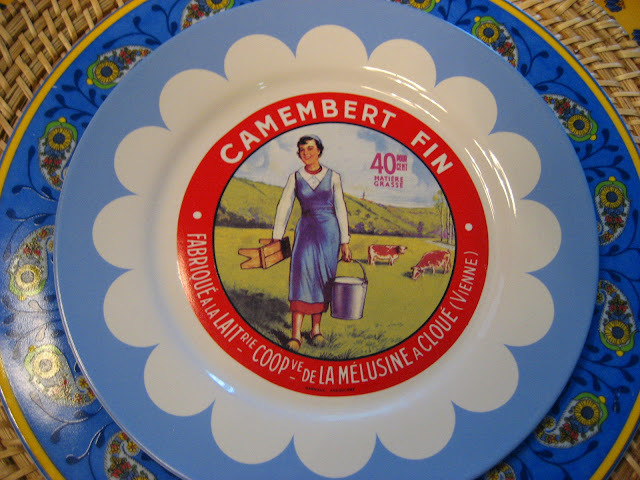 There are four different plates representing camembert cheeses from different regions. ...and finally Anjou! These are some of my favorite plates! I am using my pewter flatware because it is so chunky and old-fashioned...like something you might find in an old French farmhouse! The napkins came from La Madeleine French Bakery and Café several years ago. I have used an arrangement of sunflowers in the center (faux, because my staff has a tendency to eat the real thing!) along with a pitcher and some lemons in a bowl from a local potter! The cheese will be served on this colorful tray! 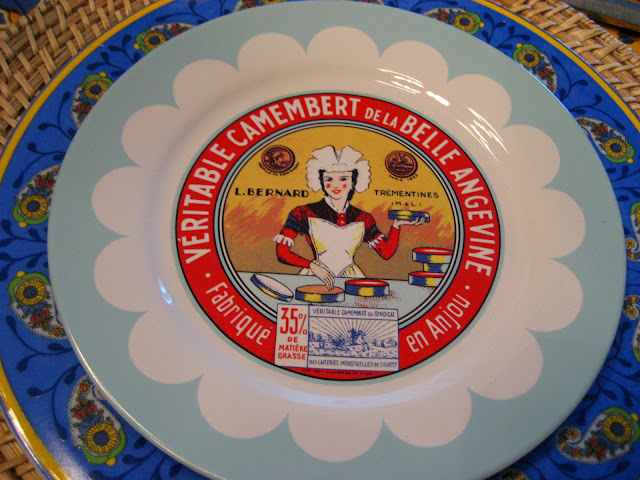 The French bread will be served from this...a typical provençal bread basket...a recent Goodwill find for $2.00!! There is just nothing to compare with real French bread! Bon appétit! There you have it! I hope you enjoyed your lunch in the Lubéron! Thanks for coming by! 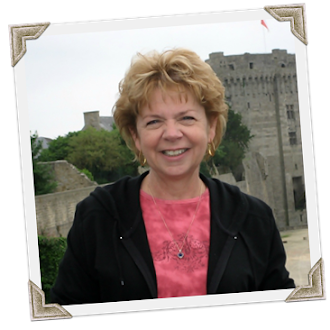 Please be sure to visit Susan to continue your tour de tablescapes! 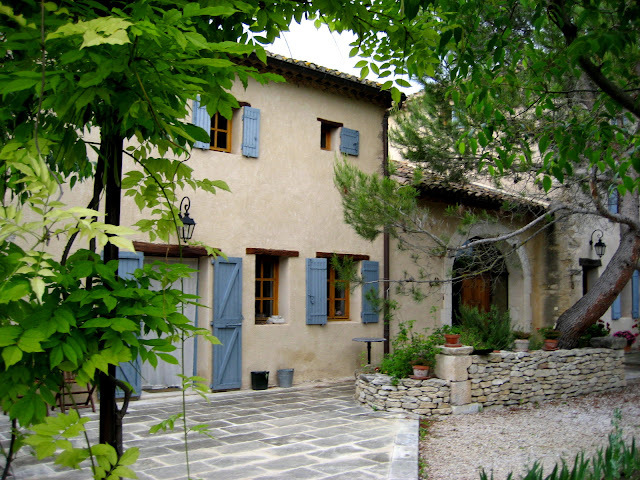 In case you are interested, the house pictured at the beginning of my post is where I was fortunate enough to spend a week in Provence! Click here to read my post! See you next time...à la prochaine! 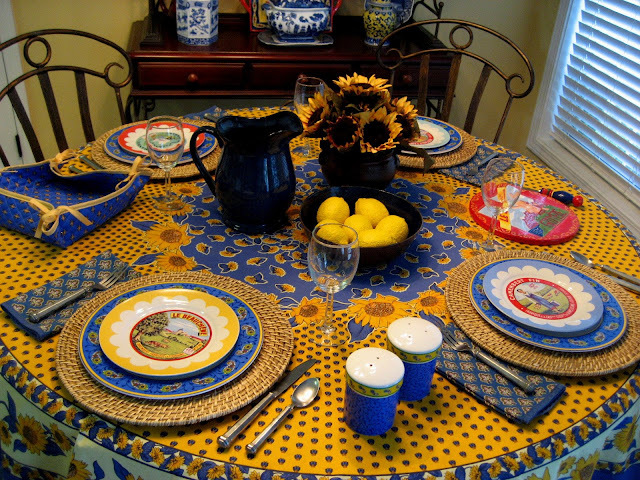 you are such a great hostess..I love the blues and yellows together...great job! I wish I was there!!! Everything looks so wonderful...so french!!! I love all your blue and yellow...it is your signature color combo...GORGEOUS!!! Have you used you flatwarw before? I have always wanted a set like this. 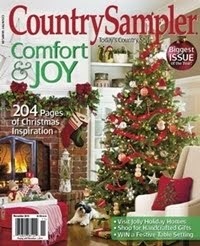 It is so chunky and country french...ooh la la!!! The tapenade sounds divine!!! I would love some right now...with a great glass of white wine...pinot grigio? Yummy!!! Really, you are so good at this! That table is fit for the queen. The tablecloth is quite beautiful. Everything looks just grand! 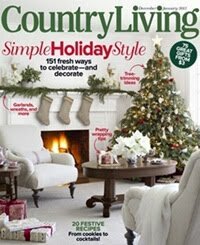 Very chic, very french country! I love the tablecloth, Debbie. What a beautiful tablescape this week. Your post reminded me of a painting by Suzanne Etienne named The Lemon Bowl! Wow, that tablecloth IS a stunner! Lovely tablescape! Love your plates too! Love the blue and yellow. Stunning! Oh, Debbie Darling! This is just wonderful! I love those cute colorful dishes. 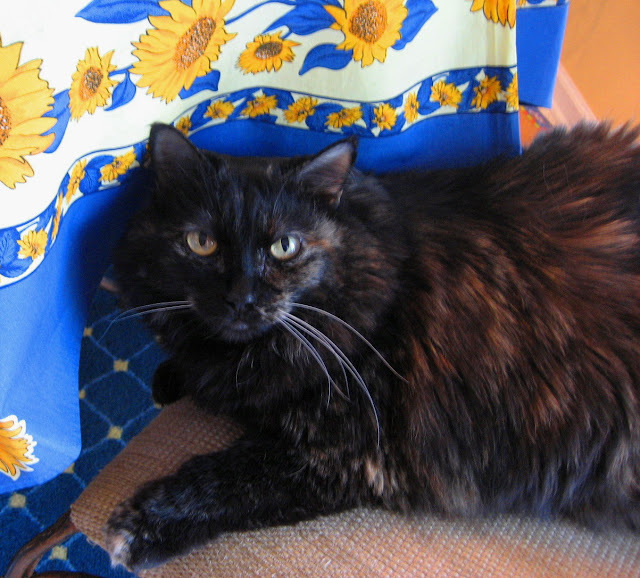 I have a tablecloth similar to yours that I bought in the French Riviera! 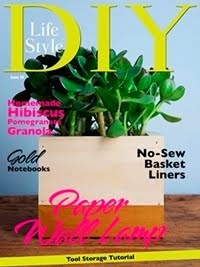 You do everything so pretty! Now, it's so good to see the boss! Love that little fuzzy face! I can so use my imagination, as I would love to be in France right now! You have created the perfect tablescape for your yummy meal!! Debbie, you have such a nice collection of plates. The plant you asked about on my header is a Mandavilla. I also have a huge white one, but it has not grown any flowers yet this year. Once is does, I will be sure to post it on Outdoor Wednesday. Giggle...the cheese plates are too precious! I love it! Imaginative composition and color story! Just wonderful! This is just lovely, and I love how you provided us with our very own French farmhouse to dine in. The menu sounds divine. Those plates are so fun. I love collection of plates that are the "same" but each is different. You do know your way around a tablescape! Hi Debbie! This table is just perfect. The colors and accessories are all so great. Well done!! Debbie - It was just devine! The colors was just delightful! The food was delicious! 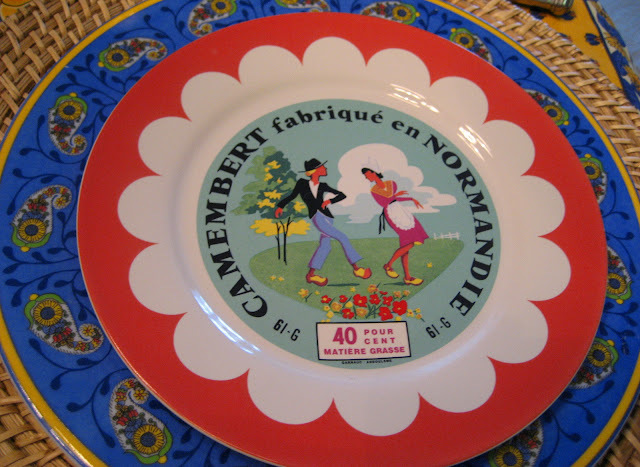 I feel like I've had lunch in France -- what a wonderful table -- love those plates from WS -- saw them and had I seen your post I would have bought them! But, alas, I didn't and now after your table, I wish I had! Deb... I love the beautiful colors of your tablescape! I can just see a group of good friends lingering for hours around the table, drinking wine, eating wonderful french food and telling stories... lots of laughter and lots of wine! I just love your sunflower theme. It speaks to me! Just Beautiful! beautiful! I love the tablecloth. And your centerpiece is wonderful. I can always expect to find a exceptional tablescape from you. You are so good at this. Have you heard from Lynne?? When I finished looking at your post I just sat for a moment, sighed deeply and wondered at the amazing talent you have for putting together a table. Those French have taste!! Wow. Beautiful! Those colors just reach out and grab you. How cozy and inviting!! I loved it. But..of course anything French grabs me. Wow yes the star of that tablescape was the tablecloth and napkins... So gorgeous! The menu sounded pretty darn good... when is lunch? 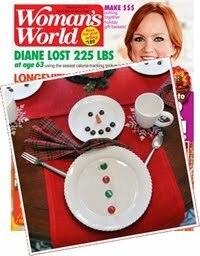 Love it, Debbie, it's adorable... from the linens to the plates! Just so bright and cute and fun! What a beautiful table you and Ozzie have set, and the food is delicious! Thanks for taking us to France again. Fabulous, Debbie! I love the table and the wonderful story to go with it!! What a beautiful tablescape Debbie. I just love the tablecloth. You have inspired me to look for more French inspired things. All of your things are just lovely. Ca m'a fait grand plaisir de déjeuner avec vous aujourd'hui! Beautiful tablescape! 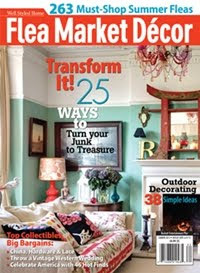 Oh, some of my very favorite colors are used here! I love the vintage feel of those plates. I'm adding you to my blog roll, hon! Your creation is just beautiful! Oh Debbie how vibrant and beautiful is this table. You are an expert tablecaper my friend. 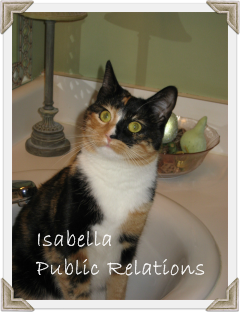 He's my new favorite...no wait Baby Kitty is...no it's Isabella...LOL! I must tell you all of your stuff are stunning cats for sure! Give them all big kitty hug from me. Okay, I am coveting all of your linens. I really could have brought back so much from our trip to Provence last month. 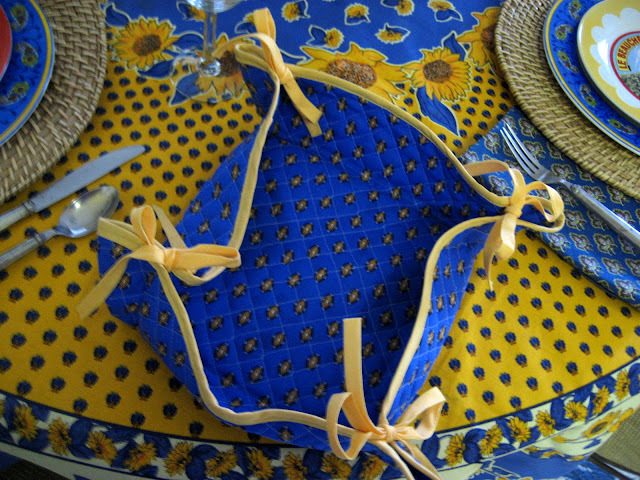 I loved every tablecloth and napkin that I saw in Provence. That tablecloth is to die for! What a beautiful tablescape. Sending you much genuine affection my dear friend. Once again you have helped take my mind and spirit back to the lovely carefree days of Provence! J'adore les livres Mayle! Votre table est belle! Ces planques sone fabuleux! I love this! This is beautiful. 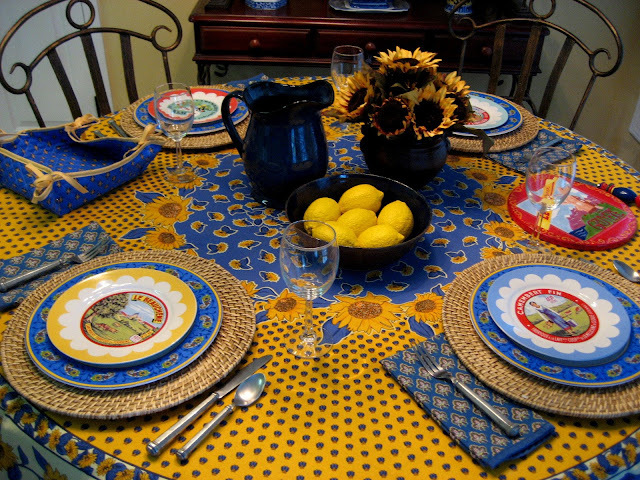 I love your plates and the vibrant colors of the tablecloth. 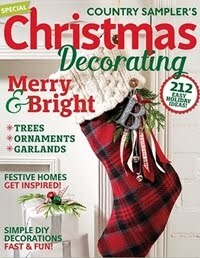 Very french and very festive! Have a blessed day. I love seeing what everyone has to show us each week! 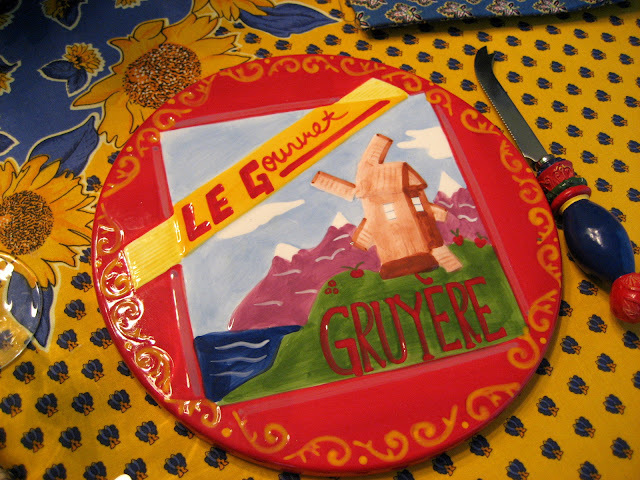 I love your pewter flatware & the cheese plates (and I don't even like cheese, but I love the plates). Fabulous table!!! I just love learning about France! Your dishes and setting is lovely as usual. 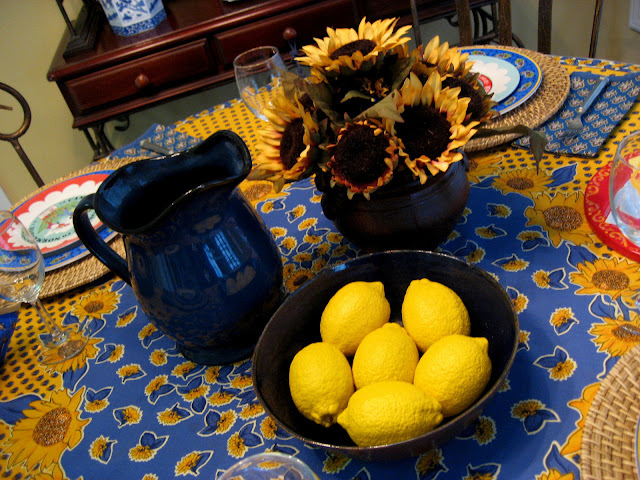 I just simply love the sunflower tablecloth! Think your friend could be mine? lol What a lovely gift! Since I know I will never get to go to France, I love seeing it through your eyes! Thank you so much for sharing your love of France! As a young girl I wanted to learn how to speak French, but they only had Spanish where I went to school. When I home schooled my girls I bought French tapes,for them to learn, but they wanted Spanish, for their is many people in near by towns that speak Spanis. I may have to dig out the French course, something I may can do when I get home from all my surgeries. I trying to make my dining room a French Country. Remember I kept fighting myself from adding blue, well I gone heavy on it. I can't wait to see what you think. Even though I never been to France and do not know a lot about the decor. I am hoping I am done ok with my decor. Soon to be finished, building shelves with hubby help, lots of new dishes, and need to sew my blue toile curtians. Go to Doc Tues. May 5th, hoping to get a little more time off before we start the year long surgeries. I can use all the idea I can get for my French Country look. If you have any I love to hear! 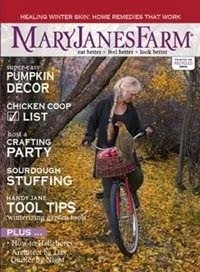 I buying sheep this weekend, promised hubby no more dishes until after the next 4- 6 surgeries this year. Well unless I find something I need for my collections. I am working hard to get things done and gettng my strength back since I got hurt. Hubby thinks I getting two sheep, I getting 1 ram 3 ewes and 2 lambs, I can't wait! Love visiting you! You are so creative! 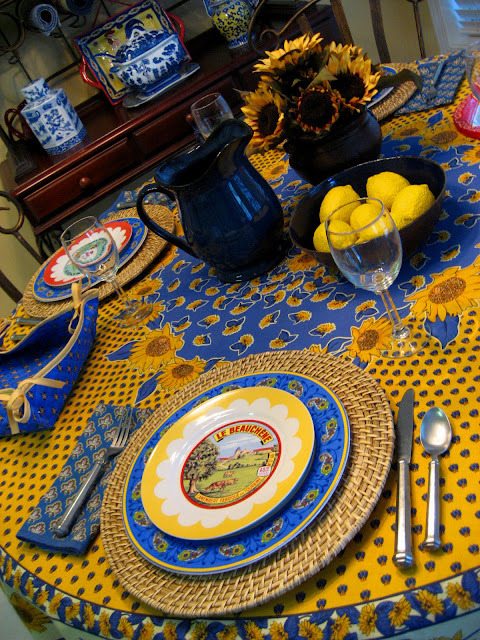 Hi Debbie...the best tablescape you have ever done and your past ones have been fabulous but this is a real prize...I love the plates and the table cover..It's just perfect! I always love my visits here..your tablecloth is beau and the table is delightful! I just love this tablescape. The blue & golds look soooo French. Believe it or not I have A Year in Provence sitting right here on my nightstand. Isn't it a wonderful book? 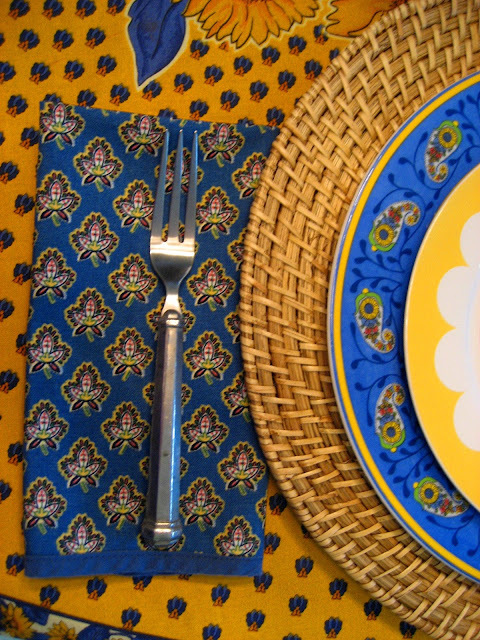 I really like the colorful cheese plates and of course the to~die~for tablecloth! Je te l'ai donne! (I gave it to you) You won the contest! I need you to email your address so I can send you your loot! Thanks for becoming a follower! Your tablescape is fabulous.....everything is so perfect and oh so cute. 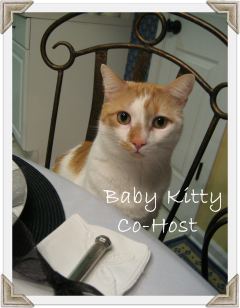 I really enjoyed your tablescape! I love all the colors! The tablecloth is fabulous! ms Debbie...you bring your coffee mug and we will have a java break together in the Dacha tower! have a lovely weekend, my friend !! Even though I am late to lunch it was a fresh, for sure, as when the first visit came. Loved the Frenchy tea party and thank Ozzie, we felt quite honor for him to grace our table. Hope you had a good time mowing, I did. Now I need to do a little rock, limb, and debris clearing so the mower to go even farther. Thanks for the cheese and bread, I got the wine. The header, the music, the kitties, the gorgeous linens, the centerpiece, and china...it's all just too much for my francophil-ish weak heart! Awesome! I love your table. It's beautiful! Lve your new header photo, Debbie! Don't worry, I do not have a cat. We have stray cats that we feed but they are not always here and I've only seen the skink once. Your table looks lovely! So cheerful. I think I mentioned before I have the same yellow and blue china - and the same napkins in blue also. We are definitely kindred spirits. What a beautiful tablecloth! And I love the colors. 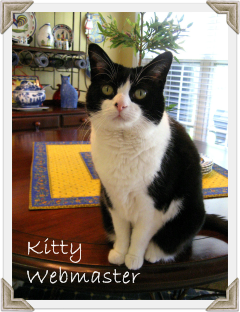 Cute picture of your kitty too!